Renée French (born 1963) is an American comics writer and illustrator and, under the pen name Rainy Dohaney, a children’s book author. 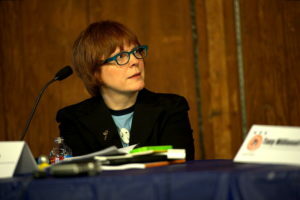 Her work includes H Day (Picturebox), The Soap Lady (inspired by the display in the Mütter Museum) (Top Shelf Productions), The Ticking (Top Shelf Productions), Micrographica (Top Shelf Productions), Edison Steelhead’s Lost Portfolio – Exploratory Studies of Girls and Rabbits (Sparkplug Comicbooks), and Marbles in My Underpants (Oni Press). She also has a weekly strip in the New York Press. Her serialized comic Baby Bjornstrand appears on the Study Group Comic Books website. The New York Times said her graphic novels “split the difference between adorable and horrifically gross”; writing about Baby Bjornstrand, they called it “equal parts Daffy Duck and Samuel Beckett, and all quirky Renée French”. French has a serialized illustrated story in the Fantagraphics Books quarterly Mome called “Almost Sound”. She is also the author of the comic book for children, Barry’s Best Buddy, released by Toon Books in 2013.